Summer Special 9/1-9/25! Don't Miss the Deal! Spend the summer in this luxury 5-bedroom villa with 2-master king suites. Enjoy the comfort in the Home Away From Home! $899/week (25% off $1,199). We pay tax for you! Our beautiful vacation home is located in the upscale Indian Creek community -- one of the most sought after vacation communities. Indian Creek is just 3 short miles from the Disney entrance. Whether you're in Florida for the attractions or simply to relax, you've found the perfect location. 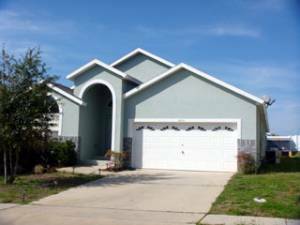 The community is no more than 2 minutes to US 192 and 25 minutes drive from any of the major Theme Parks and Attractions, 30 minutes from Orlando International Airport, and no more than 90 minutes to the beautiful sandy beaches of the Gulf or the Atlantic coasts. This 5-bedroom and 4-bathroom villa was completed only a few years ago and has been built and furnished to a very high standard. The over 2,157sqf villa can host up to 12 guests, making it ideal for large families or reunion. 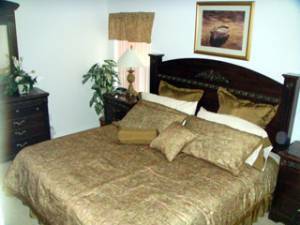 The villa has 2 king master suites and 1 full-size bedroom. 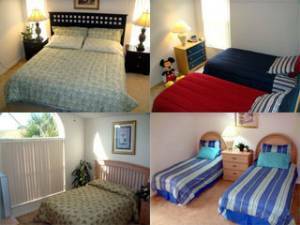 Two other bedrooms both have double twin-size beds. Master Bedroom 1 overlooks the pool and has direct pool access via patio doors. Master Bedroom 2 (situated at the back of the property) has access via the ensuite onto the pool. 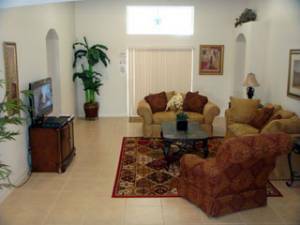 Both master suites have HDTVs with Dish Network service for over 100 channels. The full-size bedroom also has a TV. All the bedrooms are fully furnished with built-in closets, chest of drawers and mirrors etc. One ensuites bathroom has twin washbasins, large bath tub, walk-in shower with glass door. The 2nd ensuites bathroom has washbasin and large bath tub. Both bathroom 3 & 4 have bathes and showers. The eat-in kitchen overlooks the great room. It is tastefully decorated with and is fully equipped to make your "dining-in" a delightful experience. It has all the modern conveniences of a home. The living room is spacious and airy. It's where everyone would love to gather to relax and be entertained. With the 42" HDTV, you can enjoy over 100 channels from Dish Network. 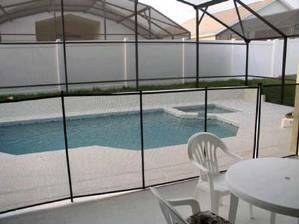 The living room has direct access to the screened lanai and pool area. The open floor plan allows interaction between the kitchen and the living room. There is a queen-size convertible sofabed to accomadate extra guests in the living room. The dining room is located at the front of the property. 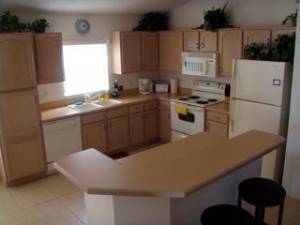 There is also an informal dining area located adjacent to the kitchen. The rear of the property boasts a magnificent fully screened, sparkling swimming pool with SPA. The outdoor fans are situated under the shade of the lanai, giving it a cooling breeze. The pool is 26ftx13ft and is approximately 0.8-1.6 metres (2'8"-5'6") deep. Child alarms are fitted to ALL villa doors leading to the pool area. The pool with SPA provides an excellent venue for sunny days and balmy evenings. There are cushioned chairs and loungers for our guests to enjoy. 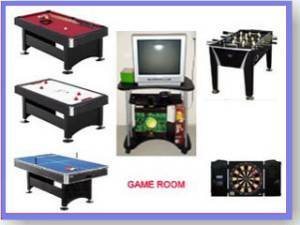 The gameroom brings the guests extra fun with a foosball table, a tennis ball, an air hockey and a pool table. There are also a darting board, a karaoke with thousands of songs, a video game console, playing cards, puzzles and kids toys etc. The community has a children’s play area, tennis courts, football pitch, putting green and jogging path if you want to stay local. The local supermarkets, shopping outlets and restaurants are all but a short drive away, with numerous facilities including shops, bars, restaurants (all the well known chains). A golf course and a 24 hour supermarket are only minutes away on US Hwy 192. The hustle and bustle of downtown Kissimmee is only a couple of miles away. Orlando is the golfers' paradise and there are over 150 superb courses within an hour's drive. The Mystic Dunes is two minutes away and the highly acclaimed David Leadbetter Golf Academy is just 10 minutes away at Champions Gate Golf Club. 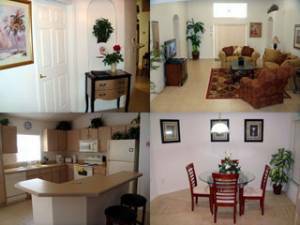 Access to Interstate 4 is also very convenient, leading to Universal Studios, Islands of Adventure, The Florida Mall, Kennedy Space Center and the wonderful beaches of Clearwater, St.Petes and Cocoa Beach. Comment: The house is great, wonderful so beauty and the appliances and furniture are perfect and the house was very clean inside, we had a perfect time. I am sure that my next vacation your home will be my first option and I will recommend it to my friends and coworker. Thanks a lot. Note: Until confirmed, rates are subject to change without notice. Additional charge for pool heat. For stays of 6 nights or less, an additional cleaning charge of $105. Discounts available for stays longer than 3 weeks or more or for small parties (eg couples) - please ask for details. Accept PayPal, cheques or money orders. Refundable USD $300 deposit required with booking. Balance is due 60 days prior to check-in. Deposit: $300 deposit due upon reservation. Cancellations and Refunds: See above.